The Lanker Push Up Stands with padded grips are a great way to enhance the overall development of the upper body, including both the chest and triceps. They will allow for a greater range of motion versus a regular push-up, while also helping to alleviate stress on the wrists. They provide a deeper stretch to build longer muscles. Three components per stand snap together for easy assembly. The Lanker Push-Up Bars allow for a greater range of motion, giving you better and more efficient development of muscles. One pair of Push-Up Bars, conveniently portable, and made of durable and high-quality material. Designed to keep hand placement centered and solid through any push-up variation. BENEFITS: Lanker Push Up Bars are designed to prevent wrist strain and will assist in keeping your hand placement centered and solid through any push-up variation. DETAILS: The muscle groups that are primarily used are the Pectorals (Chest) and Triceps (Back of Arms). The Push-Up Bars allow for a greater range of motion, giving you better and more efficient development of these muscle groups. 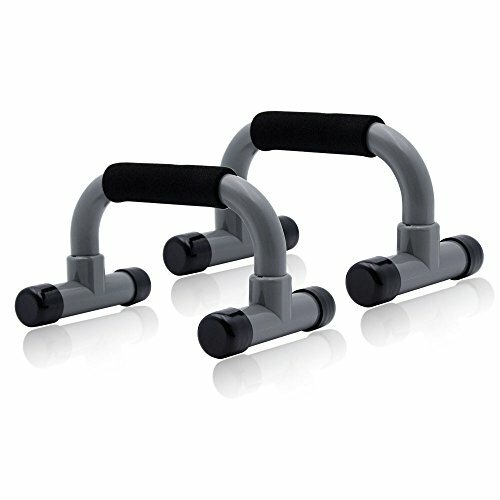 FEATURES: One Pair Push-Up Bars, conveniently portable, made of durable and high-quality material. No other exercise, outside of weight training, builds and tones the pectoral and tricep muscles more efficiently than pushups. By utilizing the Push-Up Bars, you get a greater range of motion, thereby enhancing you upper body workout. EASY TO USE - Portable, lightweight fitness equipment that are perfect for push-ups at home, gym, office, or travel. Stick them in your bag and you have all set.